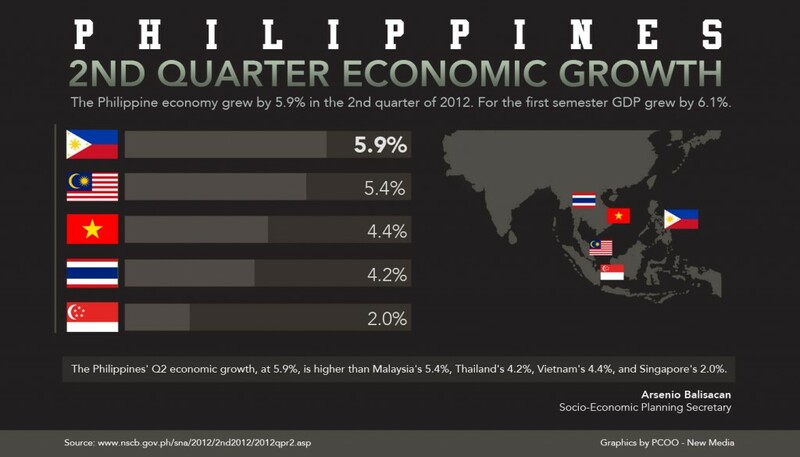 Philippine economy grew by 5.9% in the second quarter of 2012, outpacing most of the economies in Asia. 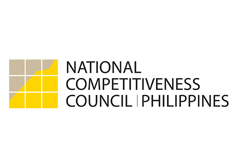 The gross domestic product growth for the second quarter was way above the Asean preliminary average growth rate of 4.7% and higher than the industry forecast of 5.4%. The country’s GDP growth rate in the second quarter was higher was higher than Malaysia’s 5.4%, Thailand’s 4.2%, Vietnam’s 4.4%, and Singapore’s 2%. Of the countries in Asia, only China, with a GDP growth rate of 7%, and oil-rich Indonesia, with a GDP growth rate of 6.4%, were able to outperform the Philippines in the second quarter. Socio-Economic Planning Secretary and National Economic and Development Authority director-general Arsenio M. Balisacan told a press briefing that the growth was a result of a robust public sector spending and stronger household consumption. “Our economy remains cushioned, resilient with sound macroeconomic fundamentals. The government will continue to accelerate spending,” he said. Government spending and household consumption grew by 12% and 8.3%, respectively in the second quarter . The economy grew by 6.1% in the first half, above the official target of 5% to 6% for the year. Balisacan said that the government would stick to target. Exports which grew by 6% in the second quarter, remains surprisingly strong, according to Balisacan. “Exports survey was surprising, given the decline of semiconductors. But our exports base has become wider, more diverse,” he said. Remittances from our overseas workers and tourism arrivals raised the Gross National Income (GNI) to 5.6% from 2.4% last year. For the first semester, GNI grew by 5.4 percent from 3.0 percent in the first semester of 2011. Based in the projected population of 96 million, per capital GDP accelerated to 3.7%. Similarly, per capital GNI increased by 3.4%. “We are seeing a resurgence of capital formation (investment spending) from the private sector,” Balisacan said. “International investors are closely watching us. We have to make sure that our fiscal house is in order and (we need) to address infrastructure development,” he said. Credit watchdog Standard & Poor’s recently upgraded the country’s debt rating to BB+, one notch below investment grade. This means that because of the strong economic fundamentals, the government can avail more loans with lower interest. In the first quarter, Philippine economy grew 6.4%, outpacing its Southeast Asian Neighbors and far surpassing the IMF growth forecast of 3.5%. Philippines Stock Exchange Index hit an all-time high, showing just how confident investors are about Philippine assets. Bloomberg said that the peso was the best performer among the 11 major Asian currencies.